It goes without saying that Eric Pollard is one of the most influential skiers out there and has been for almost a decade. Pollard is set apart from most not only with his effortless style, but also with his artistic and development talent. Whether it be pushing the industry with his ski shapes and profiles, his incredibly detailed pieces of art (that are on top of our skis), or the insanely beautiful and fun videos that Nimbus comes out with to entertain the masses, saying Eric Pollard is influential in the ski industry would be an understatement. It’s just good to see him get the credit he deserves. Check out Pollard being highlighted in ESPN’s Thinkers Series. 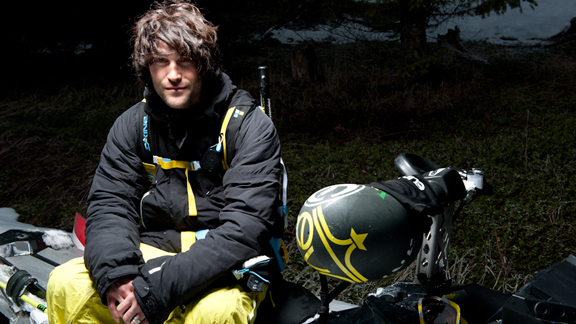 When he’s not painting or filming or being otherwise artistic, Eric Pollard, 27, is a pro skier. In 2007, Pollard joined up with Andy Mahre, Pep Fujas, Chris Benchetler and Eric Iberg to form Nimbus Independent, a film company with the goal of creating ski footage unlike any produced before. Now Nimbus releases a series of films throughout the season on their website. The next episode, part of a collection of trip-based films called “En Route,” drops September 15. We spoke to Pollard about working for free, fine art and what inspires his ideas. A man and his snowmobile: Eric Pollard wearing the Dakine pack he designed. When we first started Nimbus, we wanted to do something completely new. I said, ‘Let’s stop talking about it, let’s do it.’ We’ve tried out many different formats. We’ve done DVD, we’ve tried to sell it online, we’ve given it away. We’re constantly fine tuning. Our goal is to entertain and share our perspective on skiing in a package that’s consumable for people. I don’t actually get paid from Nimbus. As a business, it’s not successful. It’s been a lot more work than I anticipated — it’s almost a full-time job. But it’s worth it. I wouldn’t say I do it for the love. I do it because I like to control how we’re being portrayed. I like treating each movie like an art piece. …. Click HERE to read the rest of the interview with the man that came up the Sir Francis Bacon, EP Pro and the EP Pro Shorty!